We recently caught up with our 2010 IAMAT Scholars, Li YunFeng (Aaron) and Dou YongYing (Colin), who just finished an intensive six-week training course at the Kaiser Permanente Honolulu Clinic. The two students were each awarded a scholarship last September through IAMAT’s International Travel Medicine Education Program. The initiative, which is solely funded through the generosity of IAMAT members, has supported 15 medical practitioners to train in travel medicine since 2002. This unique program provides an opportunity for doctors and nurses from developing countries to study in North America and return home to teach their colleagues. In turn, they help IAMAT expand its international Medical Directory. Both Aaron and Colin live in northern China. Colin is a doctor at the Tianjin International Healthcare Center and Aaron is a doctor and medical researcher at the Liaoning International Travel Healthcare Center in Dalian. We talked about their work back home, their training experience in Hawaii, and what they hope to accomplish with their new knowledge in travel medicine. Left photo: Li YungFeng (Aaron) doing one of his favourite activities, hiking in China. 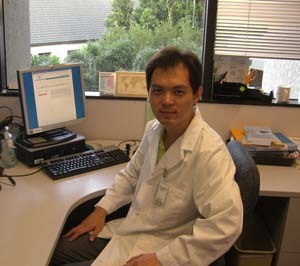 Top photo: Dou YongYing (Colin) taking a break at the Kaiser Permanente Honolulu Clinic. Discussing Aaron’s and Colin’s work in China drives home the message of how important travel medicine is to global health objectives and its link to economic and political realities facing us today. Colin experiences first hand China’s foreign policy and international trade objectives sending unemployed or under-employed workers from rural areas in China to African countries to build major infrastructure projects such as roads, buildings, mines, and dams. Prior to leaving, migrant workers, mainly merchant sailors and labourers, need to have a clean bill of health (physical exam, ECG, X-rays, blood tests), get vaccinated and informed on how to prevent infectious diseases like malaria, yellow fever, and schistosomiasis. Everyday, Colin sees between 50 to 100 workers heading for Africa, mainly Egypt, Tanzania, and the Democratic Republic of Congo. He tells us that his clinic’s efforts to prepare migrant workers against possible health risks abroad is paying off – the majority come back healthy. Aaron’s work as a lab researcher (he’s currently working on Hepatitis C) gives him an important insight into the links between epidemiology (the study of diseases and health patterns) and travel medicine. His interest in the mechanics of infectious diseases – how and why outbreaks occur – and analyzing the latest information on the spread of diseases allows him to enhance his delivery of travel health care to patients. Both Colin and Aaron emphasize the need for more travel medicine expertise in China. The field is still in its infancy and mostly unknown among the general population. As more and more Chinese are starting to travel internationally, pressure mounts to train more medical practitioners and reach more travellers before their trip. Colin believes that the knowledge exchange component of the IAMAT scholarship program is important. Chinese practitioners look to North America and Europe for expertise and says that “being an IAMAT scholar will help me develop an authoritative and systematic knowledge of travel medicine.” In return, the scholars educate their Hawaiian colleagues about developments in China, presenting on the occurrence of schistosomiasis (freshwater snail-borne infection) and the challenges of travelling with a disability in their home country. For both Aaron and Colin, the training opportunity is an eye-opener. Under the guidance of Dr. Vernon Ansdell and Dr. Johnnie Yates at the Honolulu Clinic, they are discovering the problem-solving nature of travel medicine. Colin says that the most interesting aspect for him is balancing health recommendations and the needs of travellers. “For example,” he notes, “if elderly people or pregnant women travel abroad and expose themselves to malaria or yellow fever, we must weigh the side-effects and benefits” before prescribing preventive medication. For him, travel medicine is a process of thinking through a problem to provide the best advice and care possible. The preventive, or pre-clinical, aspects of travel medicine is what interests Aaron most. To provide appropriate recommendations, practitioners need to consider the traveller’s health status, destination, itinerary, and assess the health risks of their trip. At the clinic in Honolulu, they see all types of travellers planning trips around the world. They are immersed in the day-to-day aspects of running a clinic and interact with travellers providing input on health advice given by their mentors. Their training also involves reading up on the latest developments in the field and learning travel medicine case studies. Interesting cases they’ve seen so far at the Honolulu clinic: Senior travellers going to Iguaçu Falls and evaluating the risk of providing the yellow fever vaccine to persons over 75 years of age, and a suspected case of leishmaniasis in a soldier returning from Iraq. “I think the most important thing for a travel medicine doctor is to travel,” says Aaron. He’s particularly inspired by Drs. Yates and Ansdell who are international travellers themselves. “They often share their personal experiences with travellers which is informative and a way to make travellers understand the importance of protecting themselves more easily,” he adds. Since it’s their first time travelling internationally, both Aaron and Colin laughed when they mentioned their experience with jet lag coming over to Hawaii. Now they know what the effects are and they can inform travellers on how to cope with it. Both scholars are keen to share their new knowledge and training with their colleagues back home. Aaron will be looking at ways to improve his clinic’s travel health care delivery – making it more patient-focused, something he learned at the Honolulu clinic. He’s also thinking of setting up internal training sessions for his colleagues, discussion forums, a phone hotline for travellers, translating travel health resources to Chinese, and improving their website to advertise the clinic’s services. Colin too, will train his colleagues to give them a more comprehensive understanding of travel medicine. He also wants to introduce new vaccines to his clinic to benefit travellers (new Japanese Encephalitis, quadrivalent meningitis, polio, Hepatitis A) and look for collaborative research opportunities with other travel medicine institutes around the world. In addition, he plans to “develop travel consultations based on the travellers’ destination so that we can provide better services to fit the needs of travellers.” During the training, he learned the importance of giving travellers country and region-specific advice which is currently not the case at his clinic in Tianjin. Part of the IAMAT scholarship is to promote cultural exchanges between the scholars and the host clinic. Colin and Aaron are learning about local Hawaiian customs, visiting cultural sites, and they experienced their first Hallowe’en which is not celebrated in China. Aaron takes the time to meet locals and practice his English speaking and listening skills. Colin has taken up beach volleyball and has had the pleasure of skydiving which he finds thrilling. Asked about the effects of being away from home for a long time, both say that Skype helps them to communicate with friends and family. Both their families are supportive of their training opportunity. Says Colin, “I believe when you gain something, you must lose something. My family and friends support me to study travel medicine in Hawaii.” Aaron adds, “It’s a little hard, but it is a good opportunity and a lucky opportunity for me to improve my skills and knowledge”. 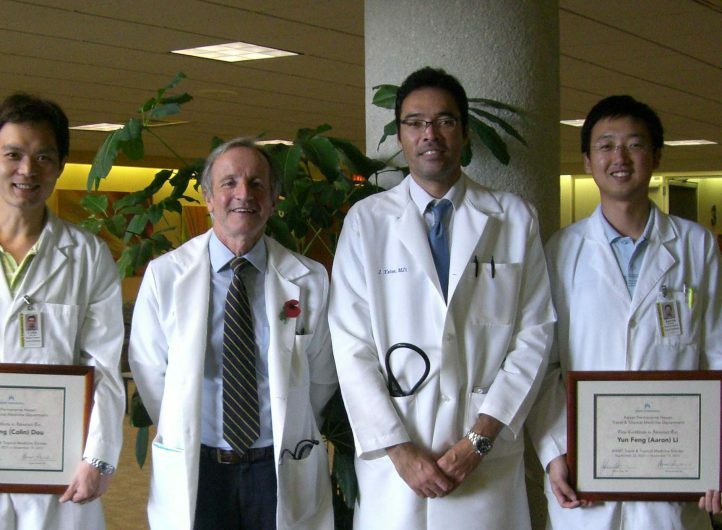 Feature image from left to right: Colin, Dr. Vernon Ansdell, Dr. Johnnie Yates, and Aaron.